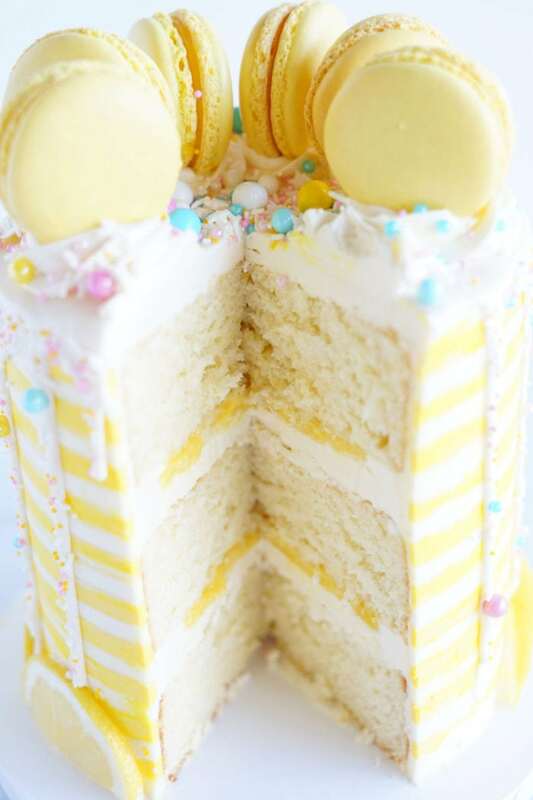 This Lemon Cake, filled with a tangy homemade lemon curd and rich Swiss Meringue Buttercream, is the perfect cake for spring, Easter, and even summer! 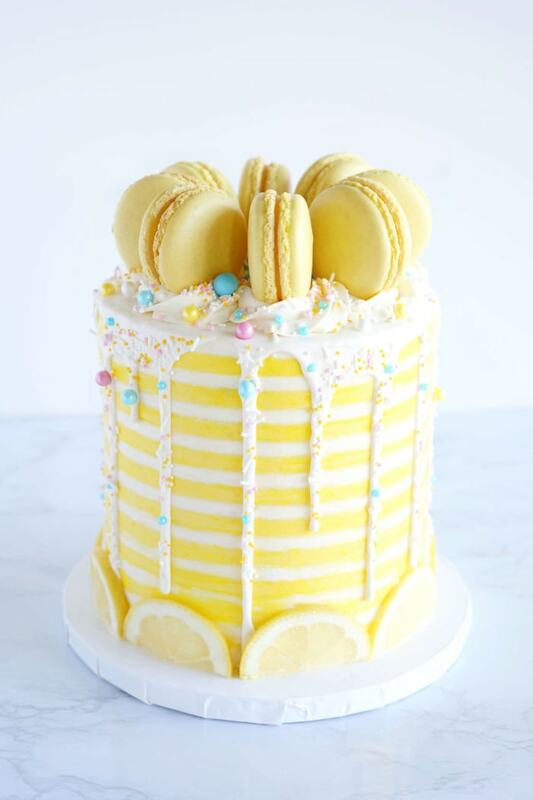 Truly inspired by the sunny season, this mouthwatering lemon layer cake is sure to brighten anyone’s day! 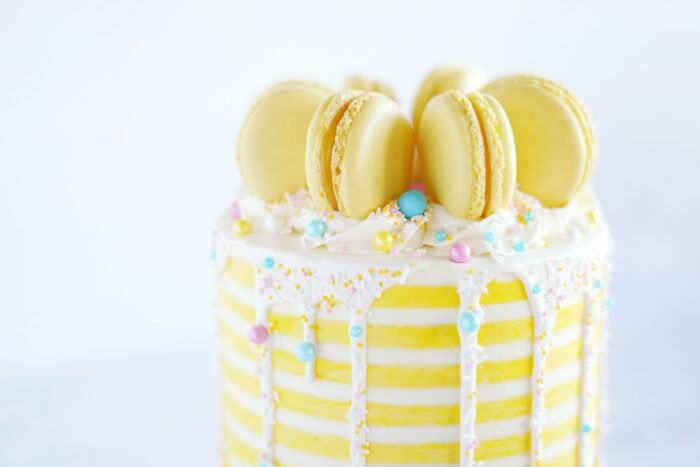 Looking for a gorgeous cake to bake for an upcoming celebration this Easter holiday season?! Or a fun idea to brighten someone’s day this spring? I am so excited to share this amazing Lemon Cake recipe! I am simply blown away by our sweet contributor Ashley Byma with this one. She seriously knocked it out of the park! And I know, this cake may seem a bit daunting for those of us who don’t bake and decorate cakes that often, and that’s okay! 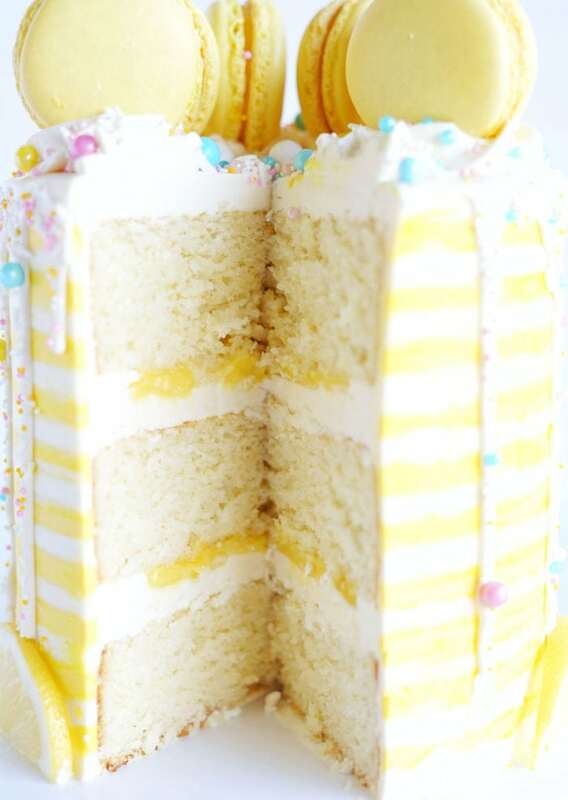 It may be kind of intimidating, but this lemon layer cake recipe can serve as inspiration for other Easter cake or springtime dessert ideas if you’re not quite up to baking a whole cake! Whether you make this amazing recipe or ask your favorite bakery to do it for you, plan to send out invites to friends and family to come over and share a big slice! What better way to brighten someone’s day than with cake! All you need to make this Lemon Cake is one box of store-bought white cake mix and a few other ingredients. Crazy right?! With how beautiful the finished cake looks, people will think you bought it from a gourmet bakery! This cake is just a wonderful reminder that sometimes the best things in life can be achieved in small ways. I mean, this cake batter literally takes no time to make! To get rolling, preheat your oven to 325 degrees, and spray three 6-inch cake pans with cooking spray as prep. Don’t forget to line the bottom of each pan with parchment paper so the baked cake doesn’t stick! Next, you are going to want to add the cake mix into your mixing bowl along with the flour, sugar, and salt. After all the dry ingredients have been mixed together, attach the paddle accessory to fold in the milk, lemon juice, sour cream, vegetable oil, vanilla, eggs, and my favorite part, lemon zest! (For that extra kick of flavor!) Make sure to mix these ingredients on low-medium speed so that they are just combined but not overmixed. Once everything has been mixed, pour a third of the cake batter into each of the cake pans and bake them for 25 minutes or just until the middle of each cake is set. A great trick for making sure if the cake is thoroughly baked is the toothpick test. Just insert the toothpick into the middle of the cakes, and if no batter comes up on the toothpick, the cakes are done! Once the cakes are completely finished baking, set them aside to cool, then take a couple sheets of saran wrap and wrap them before placing them in the freezer so that the cakes don’t crumble during the fun partㅡassembly! While the cakes are in the oven, start on making lemon curd! If you’ve ever wondered how to make lemon curd, here’s the answer! It’s really pretty simple. Gather up your ingredients for lemon curd including the lemon juice from 3-4 fresh lemons, fresh lemon zest, sugar, salt, eggs, egg yolks, and butter and get started! To begin making the curd, stir together the lemon zest, lemon juice, sugar, and salt into a small saucepan over medium heat for 5 minutes or until all the salt and sugar granules have dissolved. While that is warming-up, in a medium bowl thoroughly whisk 3 eggs and 4 egg yolks. When the sauce on the stove is ready, slowly temper the eggs by pouring the sauce into the egg mixture little by little while whisking continuously. Return this new mixture to the stove and add the rest of the eggs. Remember to stir so that the eggs don’t curdle! For the next 5 minutes continue to whisk constantly over medium heat. At this point, the curd should be done when the whisk leaves marks on the surface of the curd as it is lightly dragged over the surface. Remove the lemon curd from the heat and poor it through a mesh strainer and into a new bowl. If you see any solid egg pieces, that’s okay! Just strain them out and you’re good to go! Then, stir the chopped butter pieces into the lemon curd until completely melted. To store, press a square of plastic wrap directly on top of the lemon curd. This step is important because if you only cover the top of the bowl, you’ll get a film on your curd! Place the sealed lemon curd into the fridge for about 2-4 hours. If it doesn’t look that thick, don’t worry! As it sets it will thicken. As you probably already know, Swiss Meringue Frosting is a favorite for me. I could seriously eat it by the spoonful! Seriously, this frosting is SO delicious and only requires a handful of ingredients to make. First, heat up a small amount of water until it boils. While the water is warming up, whisk your sugar, egg whites, and salt together until combined. Then, make a double boiler with your mixing bowl and the saucepan, constantly whisking while the mixture heats up. Start mixing in the stand mixer, beginning with the low setting and slowly moving to high until the meringue looks glossy and has stiff peaks. Finally, take your butter and mix it in until smooth, then add the vanilla, making sure to put on the paddle attachment to whip the frosting on medium speed until smooth. To put together this Lemon Cake, it takes a couple of steps, but in the end it’s SO worth it. First, you need smooth cake layers. If the cake layers did not bake evenly, that’s okay, it happens all the time! Just let them thaw a bit and then use a bread knife to shave off the top to make it flat and easier to decorate. Then take your first semi-thawed lemon cake layer and place it on your cake board. After this, you’ll want to pipe a circle of buttercream around the edge of the cake layer to create a barrier. Next, add a thin layer of Swiss Meringue Buttercream inside that barrier and top with a generous layer of lemon curd. Repeat this step with the second cake. Finally, after putting on the third cake, frost the entire stack with buttercream! Yum! 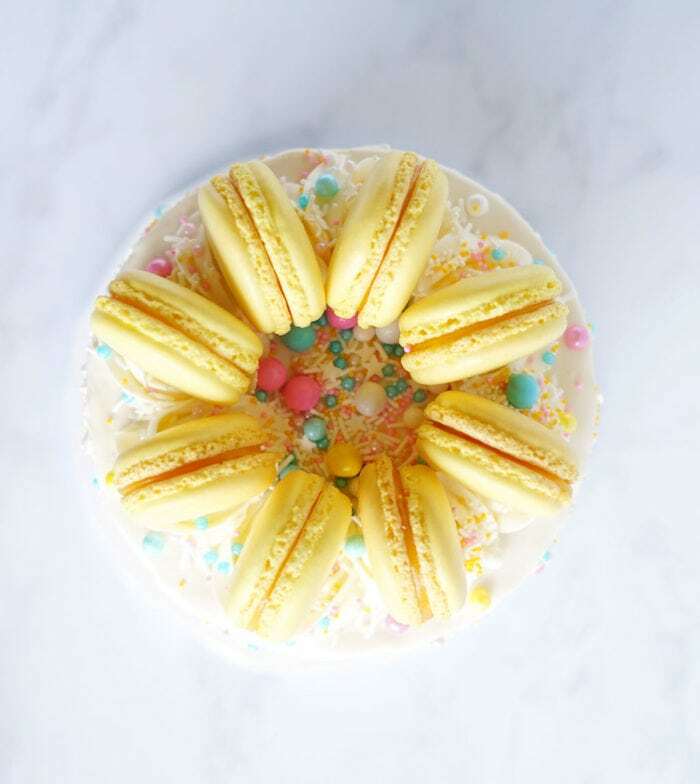 If you’ve been searching for cute dessert ideas for spring, or you just love Lemon Cake, then this one is for you! Complete with homemade lemon curd, this is the perfect springtime cake! I can’t wait to make this and to share a big slice with my loved ones this Easter! What are your dessert plans for spring? I’d love to hear how you brightened-up someone’s day in the comments below! Preheat oven to 325° F. Spray three 6-inch cake pans with cooking spray and line the bottoms with parchment paper. In the bowl of a stand mixer fitted with a whisk attachment, add the dry cake mix, flour, sugar, and salt. Mix until combined. Switch to the paddle attachment and add milk, lemon juice, sour cream, vegetable oil, vanilla, eggs & lemon zest. Mix on low-medium speed just until combined but do not overmix. Pour 1/3 of the batter into each cake pan and bake for about 25 minutes or until the middle is set. Insert a toothpick in the middle of the cake to test. 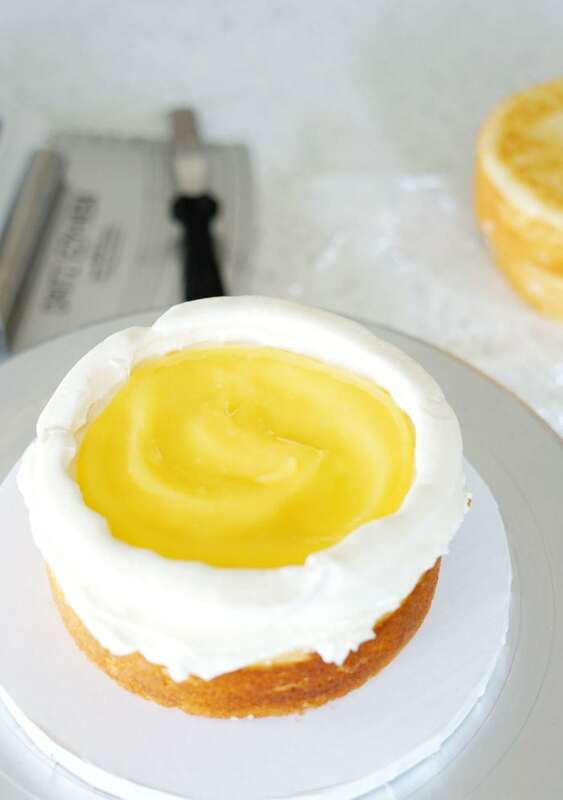 While cakes are baking, prepare Lemon Curd and Swiss Meringue Buttercream. 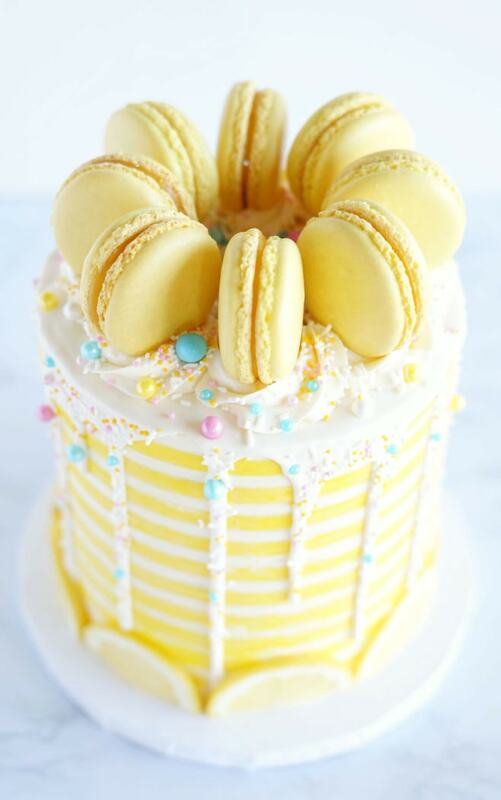 Pipe a circle of buttercream around the perimeter of the cake layer to create a barrier; add a thin layer of Swiss Meringue Buttercream then spread a generous amount of lemon curd over that. 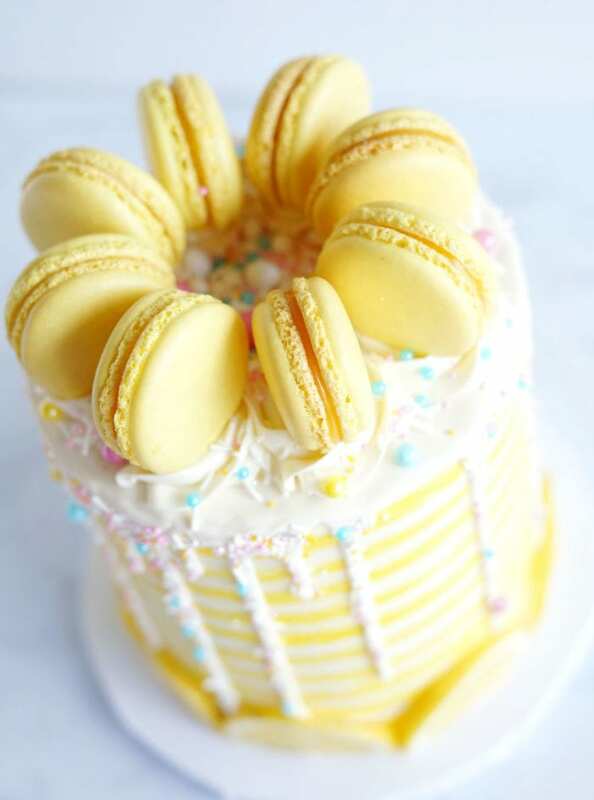 Add your second cake layer and repeat with the Swiss Meringue Buttercream/lemon curd, then frost the outside with the Swiss Meringue Buttercream.